Steampunk perhaps most recognisably features anachronistic technologies or retro-futuristic inventions as people in the 19th century might have envisioned them, and is likewise rooted in the era's perspective on fashion, culture, architectural style, and art. Such technology may include fictional machines like those found in the works of H. G. Wells and Jules Verne, or the modern authors Philip Pullman, Scott Westerfeld, Stephen Hunt and China Miéville. 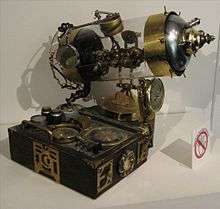 Other examples of steampunk contain alternative history-style presentations of such technology as lighter-than-air airships, analogue computers, or such digital mechanical computers as Charles Babbage's Analytical Engine. Steampunk is influenced by and often adopts the style of the 19th-century scientific romances of Jules Verne, H.G. Wells, and Mary Shelley. Several works of art and fiction significant to the development of the genre were produced before the genre had a name. Titus Alone (1959), by Mervyn Peake, is widely regarded by scholars as the first novel in the genre-proper, while others point to Michael Moorcock's 1971 novel The Warlord of the Air, which was heavily influenced by Peake's work. Brazil (1985) was an important early cinematic influence that helped codify the aesthetics of the genre. The Adventures of Luther Arkwright was an early (1970s) comic version of the Moorcock-style mover between timestreams. 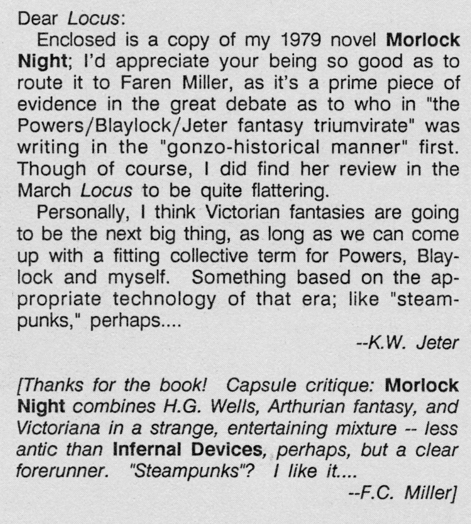 While Jeter's Morlock Night and Infernal Devices, Powers' The Anubis Gates, and Blaylock's Lord Kelvin's Machine were the first novels to which Jeter's neologism would be applied, the three authors gave the term little thought at the time. They were far from the first modern science fiction writers to speculate on the development of steam-based technology or alternative histories. Keith Laumer's Worlds of the Imperium (1962) and Ronald W. Clark's Queen Victoria's Bomb (1967) apply modern speculation to past-age technology and society. Michael Moorcock's Warlord of the Air (1971) is another early example. Harry Harrison's novel A Transatlantic Tunnel, Hurrah! (1973) portrays a British Empire of an alternative year 1973, full of atomic locomotives, coal-powered flying boats, ornate submarines, and Victorian dialogue. The Adventures of Luther Arkwright (mid 70s) was the first steampunk comic. In February 1980 Richard A. Lupoff and Steve Stiles published the first "chapter" of their 10-part comic strip The Adventures of Professor Thintwhistle and His Incredible Aether Flyer. One of steampunk’s most significant contributions is the way in which it mixes digital media with traditional handmade art forms. As scholars Rachel Bowser and Brian Croxall put it, "the tinkering and tinker-able technologies within steampunk invite us to roll up our sleeves and get to work re-shaping our contemporary world." In this respect, steampunk bears more in common with DIY craft and making. Aspects of steampunk design emphasise a balance between the form and function. So too is it like the Arts and Crafts Movement. But John Ruskin, William Morris, and the other reformers in the late nineteenth century rejected machines and industrial production. On the other hand, steampunk enthusiasts present a "non-luddite critique of technology." In November 2014, Sky Harbor Airport in Phoenix, Arizona opened a museum exhibit entitled "Steampunk: The Exquisite Adventure", featuring both local and nationally known Steampunk artisans. The displays were originally part of an exhibit at Scottsdale Public Library. Panamarenko, a Belgian Visual Artist and sculpturar building fantastic vehicles, aeroplanes, balloons or helicopters, fitting well in the steampunk imaginary . In 2016, the Antique Automobile Club of America (AACA) Museum in Hershey, PA hosted an exhibit entitled, "Steampunk U. ", featuring the works of Thomas Willeford, Tee Morris, Pip Ballantine and many others. The educational book Elementary BASIC - Learning to Program Your Computer in BASIC with Sherlock Holmes (1981) by Henry Singer and Andrew Ledgar may have been the first fictional work to depict the use of Charles Babbage's Analytical Engine in an adventure story. The instructional book, aimed at young programming students, depicts Holmes using the engine as an aid in his investigations, and offer program listings to perform simple data processing tasks required to solve the fictional cases. The book even describes a possible enhancement to Babbage's machine; a device that allows the engine to be used remotely, through telegraph lines. Companion volumes, Elementary Pascal - Learning to Program Your Computer in Pascal with Sherlock Holmes and From Baker Street to Binary - An Introduction to Computers and Computer Programming with Sherlock Holmes, were also written. The gnomes and goblins in World of Warcraft also have technological societies that could be described as steampunk as they are vastly ahead of the technologies of men, but still run on steam and mechanical power. Paul Guinan's Boilerplate, a 'biography' of a robot in the late 19th century, began as a website that garnered international press coverage when people began believing that Photoshop images of the robot with historic personages were real. The site was adapted into an illustrated hardbound book Boilerplate: History's Mechanical Marvel, and published by Abrams in October 2009. Because the story was not set in an alternative history, and in fact contained accurate information about the Victorian era, some booksellers referred to the tome as "historical steampunk." Joshua Pfeiffer (of Vernian Process) is quoted as saying, "As for Paul Roland, if anyone deserves credit for spearheading Steampunk music, it is him. He was one of the inspirations I had in starting my project. He was writing songs about the first attempt at manned flight, and an Edwardian airship raid in the mid-80’s long before almost anyone else…". Thomas Dolby is also considered one of the early pioneers of retro-futurist (i.e., steampunk and dieselpunk) music. Amanda Palmer was once quoted as saying, "Thomas Dolby is to Steampunk what Iggy Pop was to Punk!" Steampunk has also appeared in the work of musicians who do not specifically identify as steampunk. For example, the music video of "Turn Me On", by David Guetta and featuring Nicki Minaj, takes place in a steampunk universe where Guetta creates human droids. Another music video is "The Ballad of Mona Lisa", by Panic! at the Disco, which has a distinct Victorian Steampunk theme. A continuation of this theme has in fact been used throughout the 2011 album "Vices And Virtues" in the music videos, album art, and tour set and costumes. In addition, the album Clockwork Angels (2012) and its supporting tour by progressive rock band Rush contain lyrics, themes, and imagery based around steampunk. Similarly, Abney Park headlined the first "Steamstock" outdoor steampunk music festival in Richmond, California, which also featured Thomas Dolby, Frenchy and the Punk, Lee Presson and the Nails, Vernian Process, and others. Despite leaning more towards gothic influences, the 'parallel reality' of Meanwhile City within the 2009 film Franklyn contains many steampunk themes, such as costumery, architecture, minimal use of electricity (with the preference for gaslight), and absence of modern technology (such as there being no motorised vehicles or advanced weaponry, and the manual management of information with no use of computers). The plot of USSR Kin-dza-dza! film from 1986 centers in a desert planet, depleted of its resources, where an impoverished dog-eat-dog society uses steam-punk machines, which movements and functions defy Earth logic. A variety of styles of video games have used Steampunk settings. Borderlands 2 and the episodic sequel Tales from the Borderlands are set in a wasteland/steampunk environment, The Chaos Engine is a run and gun video game inspired by the Gibson/Sterling novel The Difference Engine (1990), set in a Victorian steampunk age. Developed by the Bitmap Brothers, it was first released on the Amiga in 1993; a sequel was released in 1996. Other steampunk-styled video games include the first-person shooter BioShock Infinite (2013), Dishonored (2012) stealth game, the role-playing games Final Fantasy VI (1994), Final Fantasy IX (2000), Arcanum (2001), Dark Chronicle (2002) and the late Middle Ages/Victorian age styled Thief series (1998). The graphic adventure puzzle video games Myst (1993), Riven (1997), and Myst III: Exile (2001) (all produced by Cyan Worlds) take place in an alternate steampunk universe, where elaborate infrastructures have been built to run on steam power. Guild Wars 2 has plenty of steam punk inspired content, the most notable are the Engineer player class, as well as the Charr race, with their industrial technology and aesthetics. Many steampunk themes can be found within World of Warcraft particularly the 'Gnome' race within the game. Many of the items which can be created via the Engineering profession are of a steampunk nature and also named in a similar fashion. 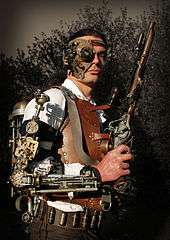 The first person shooter Timeshift (2007), developed by Saber Interactive, was intended to have a significant steampunk element and some steampunk-style technology did remain, e.g. airships, in the final game. Mega Man also has significant elements of steampunk. There is also a free 2D tower defense game Steampunk Defens, developed in 2012 by Nickelodeon and Dreamgate, which features a fully steampunk-style theme." Because of the popularity of steampunk, there is a growing movement of adults that want to establish steampunk as a culture and lifestyle. Some fans of the genre adopt a steampunk aesthetic through fashion, home decor, music, and film. 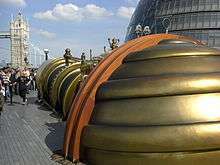 While Steampunk is considered the amalgamation of Victorian aesthetic principles with modern sensibilities and technologies, it can be more broadly categorised as neo-Victorianism, described by scholar Marie-Luise Kohlke as “the afterlife of the nineteenth century in the cultural imaginary." Steampunk became a common descriptor for homemade objects on the craft network Etsy between 2009 and 2011, though many of the objects and fashions bear little resemblance to earlier established steampunk descriptions. Thus the craft network may not strike observers as 'sufficiently steampunk' to warrant the description. Comedian April Winchell, author of the book, Regretsy: Where DIY meets WTF, cataloged some of the most egregious and humorous examples on her website, "Regretsy". The blog was popular among steampunks and even inspired a music video that went viral in the community and was acclaimed by steampunk "notables." 2006 saw the first "SalonCon", a neo-Victorian/steampunk convention. It ran for three consecutive years and featured artists, musicians (Voltaire and Abney Park), authors (Catherynne M. Valente, Ekaterina Sedia, and G. D. Falksen), salons led by people prominent in their respective fields, workshops and panels on steampunk—as well as a seance, ballroom dance instruction, and the Chrononauts' Parade. The event was covered by MTV and The New York Times. Since then a number of popular steampunk conventions have sprung up the world over, with names like Steamcon (Seattle, WA), the Steampunk World's Fair (Piscataway, NJ), Up in the Aether: The Steampunk Convention (Dearborn, MI)., and Steampunk Unlimited (Strasburg Railroad, Lancaster, PA). Each year, on Mother's Day weekend, the city of Waltham, MA turns over its city center and surrounding areas to host the Watch City Steampunk Festival, a US outdoor steampunk festival. Steampunk also has sprung up recently at Renaissance Festivals and Renaissance Faires, in the US. Some have organised events or a "Steampunk Day", while other Fests simply support an open environment for donning Steampunk attire. The Bristol Renaissance Faire in Kenosha, Wisconsin, on the Wisconsin/Illinois border, featured a Steampunk costume contest during the 2012 season. The previous two seasons featured increasing participation in the phenomenon. Steampunk also has a growing following in the UK and Europe. 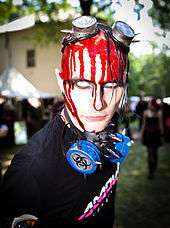 The largest European event is "Weekend at the Asylum", held at The Lawn, Lincoln every September since 2009. Organised as a not-for-profit event by the Victorian Steampunk Society, the Asylum is a dedicated steampunk event which takes over much of the historical quarter of Lincoln, England, along with Lincoln Castle. In 2011 there were over 1000 steampunks in attendance. The event features the Empire Ball, Majors Review, Bazaar Eclectica and the international Tea Duelling final. "The Surrey Steampunk Convivial", held in New Malden, Surrey (not far from where H. G. Wells used to live) takes place twice a year, and has spanned three boroughs and five venues. Attendees have been interviewed by BBC Radio 4 for Phil Jupitus and filmed by the BBC World Service. The West Yorkshire village of Haworth has held an annual Steampunk weekend since 2013, on each occasion as a charity event raising funds for Sue Ryder's "Manorlands" hospice in Oxenhope. ↑ "Definition of steampunk". Oxford University Press. Retrieved 6 October 2012. 1 2 Latham, Rob (2014). The Oxford Handbook of Science Fiction. p. 439. ISBN 9780199838844. ↑ Seed, David (2007). A Companion to Science Fiction. Oxford: John Wiley & Sons. p. 217. ISBN 9781405144582. 1 2 3 4 5 6 7 Strickland, Jonathan. "Famous Steampunk Works". HowStuffWorks. Retrieved May 18, 2008. ↑ Daniel Silva, The Emergence of Steampunk, 2012, p. 24. ↑ Oliveira, Camilla (2015-11-02). "Steampunk: The Movement and the Art". Wall Street International - Culture Section. ↑ Daniel, Lucy (2007). Defining Moments in Books: The Greatest Books, Writers, Characters, Passages and Events that Shook the Literary World. US: Cassell Illustrated. p. 439. ISBN 1-84403-605-7. ↑ Kunzru, Hari (4 February 2011). "When Hari Kunzru Met Michael Moorcock". The Guardian. Retrieved 10 September 2016. ↑ Bebergal, Peter (2007-08-26). "The age of steampunk". The Boston Globe. Archived from the original on April 14, 2008. Retrieved 2008-05-10. 1 2 3 4 La Ferla, Ruth (May 8, 2008). "Steampunk Moves Between 2 Worlds". New York Times. Retrieved 2010-11-21. 1 2 Braiker, Brian (October 31, 2007). "Steampunking Technology: A subculture hand-tools today's gadgets with Victorian style". Newsweek. Retrieved 2010-11-21. ↑ Kaplan, Janet (2010). Remedios Varo: Unexpected Journeys. Abbeville Press. ISBN 0-7892-0627-7. ↑ Sheidlower, Jesse (March 9, 2005). "Science Fiction Citations". Retrieved May 10, 2008. ↑ Jeter, K.W. (April 1987). "Letter - essay from K. W. Jeter". Locus. Vol. 20 no. 4. Locus Publications. ↑ Nevins, Jess (2003). Heroes & Monsters: The Unofficial Companion to the League of Extraordinary Gentlemen. MonkeyBrain Books. ISBN 1-932265-04-X. 1 2 Bebergal, Peter (August 26, 2007). "The Age of Steampunk". The Boston Globe. Retrieved May 10, 2008. ↑ Lupoff, Richard; Stiles, Steve (February 1980). "The Adventures of Professor Thintwhistle and His Incredible Aether Flyer". Heavy Metal. pp. 27–32 et seq. ↑ Bowser, Rachel A.; Croxall, Brian (2010). "Industrial Evolution" (PDF). Neo-Victorian Studies (3:1): 23. Retrieved 12 April 2016. ↑ Guffey, Elizabeth (2014). "Crafting Yesterday's Tomorrows: Retro-Futurism, Steampunk, and the Problem of Making in the". The Journal of Modern Craft. 7 (3): 250. 1 2 Collazo, Stephanie Amy (December 6, 2011). "YRB Interview: Dr. Grymm". YRB Magazine. Archived from the original on January 25, 2012. Retrieved March 6, 2012. a dangerous tattoo machine, fusing a tattoo machine and an arm. Using a hand massager, projector parts, tube radios, a paint sprayer and miscellaneous parts (such as a glass vial of squid ink), Marsocci created an interesting piece that looks like something you’d find in Mary Shelley’s home. 1 2 Casey, Eileen (August 1, 2008). 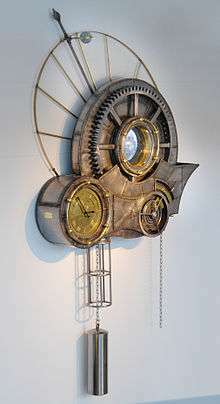 "Steampunk Art And Design Exhibits In The Hamptons". Hamptons Online. Retrieved March 6, 2012. Steampunk is not considered 'Outsider Art,' but rather a tightly focused art movement whose practitioners faithfully borrow design elements from the grand schools of architecture, science and design and employ a strict philosophy where the physical form must be as equally impressive as the function. ↑ Catastrophone Orchestra and Arts Collective, "What, Then, is Steampunk? Colonizing the Past So We Can Dream the Future," SteamPunk Magazine 1 (2006), p 4. ↑ Steel, Sharon (May 19, 2008). "Steam dream: Steampunk bursts through its subculture roots to challenge our musical, fashion, design, and even political sensibilities". The Boston Phoenix. Retrieved September 27, 2008. 1 2 3 Hart, Hugh (December 1, 2011). "Steampunk Contraptions Take Over Tattoo Studio". Wired. Retrieved December 5, 2011. ↑ Farivar, Cyrus (February 6, 2008). "Steampunk Brings Victorian Flair to the 21st Century". National Public Radio. Retrieved May 10, 2008. ↑ Jackie (October 17, 2013). "Paris Metro Travel: Full Steam(punk) Ahead at Arts et Métiers". Rail Europe. ↑ Dodsworth, Lucy (November 7, 2011). "In pictures: Paris' steampunk Arts et Métiers Metro station". On The Luce. ↑ Hartwell, Lane (September 8, 2007). "Best of Burning Man: Fire Dancers, Steampunk Tree House and More". Wired. Retrieved January 5, 2011. Kinetic Steam Works' Case traction engine Hortense glows on the playa. The art vehicle was named in honor of the artist and mother of Cal Tinkham, the steam enthusiast and railroad engineer who originally restored the engine. ↑ Savatier, Tristan "Loupiote" (2007). "Kinetic Steam Works' Case traction engine Hortense ". ↑ "Five Ton Crane". Fivetoncrane.org. 2010. Retrieved 2014-08-06. ↑ Jardin, Xeni (24 January 2008). "Steampunk Tree House". Boing Boing TV. Archived from the original on December 9, 2010. ↑ Orlando, Sean (2007–2008). "Steampunk Tree House". Retrieved May 10, 2008. ↑ "Steampunk Tree House debuts at Dogfish in Milton". Cape Gazette. 2 July 2010. ↑ "Steampunk Treehouse Finds Home At Dogfish". Dogfish Head Craft Brewery. 21 June 2010. ↑ "Maker Faire: The Neverwas Haul". Make: DIY Projects, How-Tos, Electronics, Crafts and Ideas for Makers. Retrieved 2015-11-19. ↑ "Crew". Obtainium Works. Retrieved 2015-11-19. ↑ Ryzik, Melena (May 21, 2008). "Telescope Takes a Long View, to London". New York Times. Retrieved August 5, 2008. ↑ Sullivan, Caroline (October 17, 2008). "Tonight I'm gonna party like it's 1899". London: Guardian. Retrieved October 17, 2008. ↑ PH, Julie (June 5, 2008). "Testing the Telectroscope". Londonist. Retrieved 1 August 2012. ↑ "Telectroscope Merged Topic Threads". Brass Goggles. Retrieved 1 August 2012. ↑ "BBC - Oxford - The Steampunk movement in Oxford". BBC News. 2009-10-26. Retrieved 2016-04-12. ↑ "Steampunk". Museum of the History of Science, Oxford. Imagine the technology of today with the aesthetic of Victorian science. ↑ Ward, Mark (November 30, 2009). "Tech Know: Fast forward to the past". bbc.co.uk. Retrieved November 30, 2009. ↑ "Lonely Planet launches latest New Zealand guide (2012, Steampunk HQ one of author's top 12 recommendations)". New Zealand Government official tourism website. Archived from the original on November 14, 2012. Retrieved 2014-03-21. 1 2 Stiffler, Scott (January 19, 2012). "Steampunk: The Victorian future is now". the Villager. Retrieved March 6, 2012. ↑ "Mobilis in Mobili Art Exhibit Gives Steampunks Some New Ink to Spill". Tor.com. 2011-12-02. Retrieved 2014-08-06. ↑ Bob Leeper (2014-11-24). "Steampunk airship accessories moored at Sky Harbor Airport". Nerdvana. ↑ "Steampunk U". AACA. Retrieved 2016-11-09. ↑ Campbell, Jean (2009). Steampunk Style Jewelry: A Maker's Collection of Victorian, Fantasy, and Mechanical Designs. Creative Publishing International. p. 48. ISBN 978-1-58923-475-8. 1 2 Damon Poeter (July 6, 2008). "Steampunk's subculture revealed". San Francisco Chronicle. Retrieved September 8, 2008. 1 2 Rowe, Andrew Ross (September 29, 2008). "What Is Steampunk? A Subculture Infiltrating Films, Music, Fashion, More". MTV. Retrieved October 14, 2008. 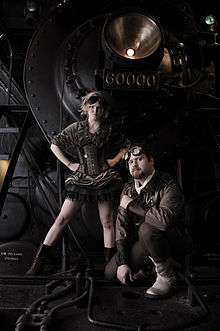 ↑ "Company Spotlight: Steampunk Couture". Steampunk Journal. February 20, 2014. Retrieved 2014-04-11. 1 2 Skarda, Erin (January 17, 2013). "Will Steampunk Really Be the Next Big Fashion Trend?". Time. Retrieved 18 February 2013. ↑ Dahncke, Pasha Ray. "IBM Social Sentiment Index Predicts New Retail Trend in the Making" (Press release). IBM. Retrieved 18 February 2013. ↑ Stubby the Rocket (June 25, 2012). "Sci-Fi Actors Wearing Steampunk Clothes Designed by Prada". ↑ Cicatrix13 (2013-03-06). "Steampunk Couture Hot on the Runway (and We're Not Talking Airships)". Steampunk Workshop. ↑ "Under the Gunn, Episode 7: "Steampunk Chic"". Threads Magazine. ↑ "America's Next Top Model goes STEAMPUNK". LacedAndWaisted. September 30, 2012. ↑ "Heliograph's Space 1889 Resource Site". Heliograph, Inc. 2010-06-30. Retrieved 2010-11-29. ↑ Csicsery-Ronay, Istvan (March 1997). "The Critic: John Clute. Look at the Evidence. Essays and Reviews.". Science Fiction Studies. DePauw University, Greencastle Indiana: SF-TH Inc. (#71; Volume 24, Part 1). Retrieved 2010-11-29. ↑ Doctorow, Cory (July 8, 2007). "Jay Lake's "Mainspring:" Clockpunk adventure". Retrieved May 10, 2008. ↑ Gosling, Sharon (February 28, 2013). "Sharon Gosling's top 10 children's steampunk books". The Guardian. London. ↑ Corbett, Sue (2012-09-28). "What's New in YA? Mashups". Publishersweekly.com. Retrieved 2016-04-12. ↑ "Meet the Victorian Steampunk Society". SFX News. November 27, 2011. Retrieved January 5, 2011. ↑ Barger, Andrew (2013). Mesaerion: The Best Science Fiction Short Stories 1800-1849. US: Bottletree Books LLC. p. 31. ISBN 978-1-933747-49-1. ↑ "Skies of Arcadia review on RPGnet". Rpg.net. Retrieved September 8, 2009. ↑ "Rise of legends as steampunk video game". Dailygame.net. Archived from the original on February 17, 2009. Retrieved September 8, 2009. ↑ Xerin (March 9, 2010). "WoW: Loremaster's Corner #5: A Steampunk Paradise". Ten Ton Hammer. Retrieved 2010-05-30. World of Warcraft is almost a steampunk paradise if you look at the various technological advancements the gnomes have made. Most engines are powered by steam and there are giant airships floating around everywhere. 1 2 "Unprecedented level of game service operation' from Steampunk MMORPG Neo Steam". June 29, 2008. Retrieved January 24, 2014. ↑ Vandermeer, Jeff; Chambers, S.J. (2010). The Steampunk Bible. Abrams Image. p. 78. ISBN 0-8109-8958-1. ↑ Clute, John; Grant, John, eds. (February 1999) [First published 1997]. "Steampunk". The Encyclopedia of Fantasy. Contributing editors: Mike Ashley, Roz Kaveney, David Langford, Ron Tiner (Rev. ed.). New York: St. Martin's Griffin. pp. 895–896. ISBN 978-0-312-19869-5. 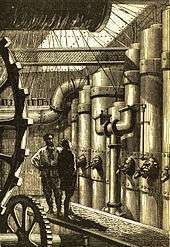 STEAMPUNK A term applied more to science fiction than to fantasy, though some tales described as steampunk do cross genres. ... Steampunk, on the other hand, can be best described as technofantasy that is based, sometimes quite remotely, upon technological anachronism. ↑ Richardson-Brown, James (2008). "Steampunk - What's That All About". The Chronicles. 2 (9). p. 10. ↑ McCarthy, Todd (August 18, 2009). "9 Review". Variety. Archived from the original on November 19, 2009. Retrieved November 19, 2009. ↑ Hudson, Patrick. "(Review of) The Difference Engine". The Zone. Pigasus Press. Retrieved February 13, 2009. ↑ School Library Journal, "Laviathan". Amazon. Archived from the original on 10 August 2011. Retrieved 10 August 2011. ↑ Bertschy, Zac (July 21, 2004). "Steamboy". Anime News Network. ↑ Waldrop, Howard; Person, Lawrence (October 13, 2004). "The Fabulous World of Jules Verne". Locus Online. Retrieved May 10, 2008. ↑ "the news and media magazine of the British Science Fiction Association". Matrix Online. June 30, 2008. Retrieved February 13, 2009. ↑ Ward, Cynthia (August 20, 2003). "Hayao Miyazaki: The Greatest Fantasy Director You Never Heard Of?". Retrieved June 13, 2009. ↑ Hayden, Tom (September 3, 2002). "Gotcha!". U.S. News & World Report. p. 39. Archived from the original on December 16, 2005. Retrieved January 5, 2012. ↑ "Boilerplate". Abramsbooks.com. Retrieved 2011-03-17. ↑ "A Preview of Boilerplate: History's Mechanical Marvel". Omnivoracious. 2009-04-29. Retrieved 2011-03-17. ↑ Simon Price (2012-03-11). "Album: The Men That Will Not Be Blamed for Nothing, This May Be the Reason (Leather Apron) - Reviews - Music". The Independent. Retrieved 2014-08-06. ↑ D.M.P. (2010-01-16). "Beyond Victoriana: #10 An Interview with Sunday Driver". Tales of the Urban Adventurer. ↑ "Audio Drome Review: Dr. Steel" (back issue). Rue Morgue Magazine, issue 42. November–December 2004. ↑ Scoggins, Wesley. "Interview: Dr. Phineas Waldolf Steel, Mad Scientist". Indy Mogul. Retrieved August 29, 2009. Many have mentioned your work in regards to Steampunk influenced bands like Abney Park (and for that matter the Steampunk "style" in general). 1 2 Kurt Andersen (6 October 2012). 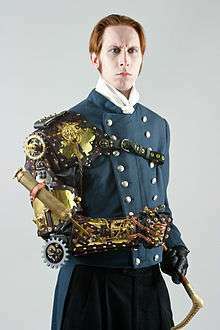 "Music festival, conference set to celebrate steampunk". Public Radio International. ↑ "In Memoriam: Joshua Pfeiffer interviews Paul Roland, Part I". The Steampunk Bible. 2012-04-12. Retrieved 2016-04-12. 1 2 Rossmore, Mark (September 10, 2012). "Steamstock: An Antiquarian Exposition". steampunk-music.com. ↑ "Thomas Dolby Debuts The Floating City Transmedia Game". Reuters. Jun 22, 2011. ↑ Orillion, Andrew (June 8, 2010). "A Fistful of Geek: A Look Back at The Adventures of Brisco County Jr.". Slant Magazine. ↑ stephanie (August 16, 2009). "Warehouse 13: Steampunk TV". closetscifigeek.com. Retrieved October 2, 2009. ↑ "TARDIS builders". Retrieved 16 December 2013. ↑ "BBC Doctor Who Classic Series". Retrieved 16 December 2013. ↑ Clarissa (October 11, 2010). "Sneak Peeks – Castle 3.04 "Punked"". TVOvermind.com. Archived from the original on March 21, 2012. ↑ "Jeannie Mai to Host GSN New Competition Series STEAMPUNK'D, 8/19". Broadway World. 2015-07-09. ↑ "The Chaos Engine". The Bitmap Brothers. Retrieved 2014-08-06. ↑ Steam Punk www.steam-punk.co.uk (2010-10-11). "Steam Punk Music, TV and Films - Steam Punk Explained". Steam-punk.co.uk. Retrieved 2016-04-13. ↑ Kaye, Marco (July 25, 2008). "Mom, Dad, I'm Into Steampunk". Retrieved August 4, 2008. ↑ Rauchfuss, Marcus (July 1, 2008). "Steampunk Aesthetics". Retrieved February 9, 2010. ↑ Miss Jessica Rose (2013-11-05). "So what is neo-Victorianism? A working definition. | Past Books". Pastbooks.wordpress.com. Retrieved 2016-11-19. ↑ "Stan Lee's Comikaze Expo 2012 Panel Schedule, Saturday, September 15" (PDF). Comikaze Expo. Sep 2012. Archived from the original (PDF) on October 20, 2012. ↑ Professor Elemental (Oct 2012). "Professor Elemental Defines Steampunk (or, at Least Tries to)". Tor.com. ↑ Swerlick, Andrew (May 11, 2007). "Technology Gets Steampunk'd". Archived from the original on December 9, 2007. Retrieved August 4, 2008. ↑ "Not Remotely Steampunk". Regretsy. Retrieved 2011-08-26. ↑ "Steampunk Infiltrates the Mainstream". Retrieved 2010-02-25. ↑ Ay-leen the Peacemaker (Jan 10, 2013). "Gearing Up for 2013: A Steampunk Conventions Listing". ↑ Hatmaker, Julia (16 November 2013). "Strasburg Rail Road's Steampunk UnLimited draws more than 1,000 on its first day". PennLive. The Patriot-News. Retrieved 26 May 2015. ↑ "Comic Con: Day Three – Steampunks!". FrockTalk.com. July 28, 2009. 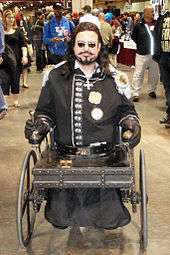 ↑ "Largest Gathering of Steampunks (2010)". Guinness World Records. Retrieved 2012-07-11. ↑ "Comic-Con 2013 T-Shirts Revealed!". comic-con.org. July 1, 2013. Retrieved 2013-07-02. ↑ "The League of Temporal Adventurers First Society Gala". Archived from the original on January 22, 2013. Retrieved 2010-07-29. ↑ Ohanesian, Liz (July 28, 2010). "Comic-Con Interview: Musician/Artist Voltaire is a Convention Renaissance Man". LA Weekly Magazine. Archived from the original on August 1, 2010. Retrieved 2010-07-31. ↑ "Promotional poster for Comic Con's steampunk after-party, "The Time Machine"". Archived from the original on March 23, 2012. Retrieved 2011-07-23. ↑ "Steampunk Empire: All Events in Bristol Renaissance Faire". Retrieved 2012-10-05. ↑ "The Asylum". Retrieved 2015-02-17. ↑ "Tea Duelling". Retrieved 2015-02-17. ↑ "H G Wells Literature and Love". G R Crawford. Retrieved 3 September 2015. ↑ "The First Surrey Steampunk Convivial". Jonathan Green. Retrieved 21 February 2012. ↑ "BBC radio documentry [sic] about Steampunk with Phil Jupitus". toswitchoffvoicemail. Retrieved 3 September 2015. ↑ "The Surrey Steampunk Convivial". Ben Henderson. Retrieved 3 September 2015. ↑ "The Haworth Steampunk Weekend". www.haworth-village.co.uk. Retrieved 2016-06-20. Alkon, Paul K. (1994). Science fiction before 1900. ISBN 0-8057-0952-5. Erlich, Richard D.; Dunn, Thomas P. (1983). Clockwork worlds. ISBN 0-313-23026-9. Guillemois, Alban (2006). Louis la Lune. ISBN 2-226-16675-0. Landon, Brooks (2002). Science fiction after 1900. ISBN 0-415-93888-0. Slusser, George; Shippey, Tom (1992). Fiction 2000: cyberpunk and the future of narrative. ISBN 0-8203-1425-0. Suvin, Darko (1983). Victorian science fiction in the UK. ISBN 0-8161-8435-6. Westfahl, Gary; Slusser, George; Leiby, David (2002). Worlds enough and time. ISBN 0-313-31706-2.